FROM the slime of tropical mud flats, the ghost voices of prehistoric monsters have reached the screen. Hisses and grunts of the pterodactyl and brontosaurus; roars from a tyrranosaurus, largest of the dinosaur family; groans and roars of an imaginary giant ape are reproduced by mechanical contrivances. Kong, the ape, crashed through the heavy growth of an unknown forest, uttering fierce growls and beating his breast in rage. As the scene unfolded in silence before a small group of us in a tiny projection room, the studio sound experts discussed ways and means of re-creating his awful voice and the solid thumps of clenched hands against the massive chest. An hour later we assembled in the scoring room, with a half-dozen contrivances at hand. Some of these, it was hoped, would turn the trick. Spivack took his place for the first recording at a kettle drum. The instrument was covered with a heavy board, a cloth stretched tightly across its face instead of the customary skin. In his hand he held two padded drum sticks. “Bongâ€”Bongâ€”Bong.” He struck the board lightly. The room filled with the resonant tone, but the depth and solid, fleshy sound one would expect to hear could not be made. Spivack turned from the drum to a nearby chair. Again simple implements began to play their parts in the filming of this imaginary tale of an unknown world. An assistant held the microphone’s delicate diaphragm an inch above the floor. Meantime the chair had been placed on a soft fibrous padding. As a bell outside the thick door rang warning that sound recording was about to begin, Spivack began to beat the cane bottom of the chair with the drum mallet. Sound technicians sitting in the tiny glass-windowed control booth had been hearing these synthetic ape sounds through the transmitting system, exactly as a theater audience would have heard them. “Not fleshy,” was the cryptic comment. Accordingly three men stepped within range of the microphone. An aide held the delicate recording apparatus against Elliott’s back. Spivack began tapping Elliott’s chest, first lightly, then with stronger blows, as he observed the sound men within the little room. At last one nodded and the speaker boomed, “Okey. We pick up the resonance. That gives us plenty of lows.” Which, translated, meant the metal ear had picked up the low notes with clarity and transmitted the body blows with considerable volume to their loud speaker. “Strange as it may seem,” Elliott remarked, “this breast-beating business has given us more concern than the vocal sounds these ancient brutes uttered. Now I’ll show you how we think they talked.” In a moment the room was plunged into inky blackness and as we found seats around the walls the picture of the ape filled the screen. He appeared to be some seven times taller than a man as he stood erect on the domed top of New York’s Empire State Building, battling with his gnarled, hairy hands an entire squadron of Uncle Sam’s army pursuit planes. He alternately roared venom at his aerial enemies and uttered deep-throated love notes over the form of a girlish figure that lay perilously near the edge of a cornice far above the street. “That roar,” Spivack explained, “provided a difficult problem, but old sound tracks finally solved it for us. You see, we have a half-million feet of animal sounds in the libraryâ€”leopards, lions, tigers, elephants; every animal, in fact, we would be apt to use in pictures. When Kong fought to the death with a tyrranosaurus, a metal and rubber and fur reproduction of those tiny-brained giants that a million years ago roamed the region of what today is Montana, the ape barked, uttered gutteral growls and breathed low, heavy gusts before breaking the tyrranosaurus neck. As I looked at the giant ape head used for the close-ups I saw a mechanical creature that outdoes nature at its best. Thirty bear skins formed the hide. The rubber nose and rubber lips dilated and grinned and the large glass eyes rolled in their sockets as six men, hidden within the recesses of the skull, turned handles to provide the necessary movement. One specialist even pumped a blood-like liquid from a tank at the base of the throat into the mouth for an added touch of realism when Kong finally vanquished his mighty antagonist. All sounds were added after the scenes were filmed. For the anthropoid’s breathing, Spivack ran an old tiger sound track backward, lowering the tone an octave. This produced a low, snarly, gutteral combination of growl and breath which starts low and climbs to a high peak, giving a sound entirely different from the animal sounds one hears today. The growl alone consists of a sharp bark, with the peak of a particularly loud blast used to tie the bark to a roar and a piece of breathing tied to that to tail the entire sound off into nothingness. As anyone knows, not even a wild animal makes love by groaning and hissing. So Spivack stepped before the microphone with only a megaphone to utter deep “r-r-r-ump,” “r-r-r-ump,” “r-r-r-ump” in long and short grunts, thereby establishing for all time the love call of the prehistoric ape. The tyrranosaurusâ€”the largest animal ever known to existâ€”sixty feet long and with a three-foot skullâ€”hisses and roars his vocal contributions to the battles and his mythical contact with man. But these two sounds, when produced with the necessary low- tones, offered too little contrast. During a battle with the ape, the voices of the two animals not only must be distinguishable, but the lows must blend. That was a poser! As the scene developed on the projection room screen, I heard what sounded remotely like the hissing of steam and a panther’s purr. NOW the brontosaurus, one of the best known of the prehistoric quadrupeds, once lived in the Wyoming-Colorado region. Little did he think that one day his gutteral croaks and hisses would reach the movie screen. But Elliot has gone the anthropologists one better; not only does he declare the brontosaurus croaked and hissed, but with dramatic license he inserts one croak after every four hisses. The triceratops resembles an enlarged boar or a rhinocerous; more like a boar, perhaps, because of the three large horns protruding from his head. This little fellow measures only twenty-five feet long, yet in the picture he bellows like a bull, gores a man and tosses him into some long-forgotten bushâ€”to the accompaniment of a reversed and lengthened elephant roar. Some of the miscellaneous sounds were created with the simple instruments one would find in any studio sound laboratory. One hour Elliot was grunting into a hollow “double gourd with a microphone conveniently placed to pick up deep growls and grunts of the triceratops; later in the morning he was half-reclined on the floor, grunting through a water-filled mouth into a megaphone, thus producing the animal’s death gurgles. When Kong went prowling down a river bed, Spivack squatted close by the ever-present mike, pounding with two enlarged plumbers’ friends on a gravel-filled pad. FOR two years the movie makers have had this fantastic picture in preparation. Technically, it has proved the most difficult idea to put into a motion picture that has ever been attempted. 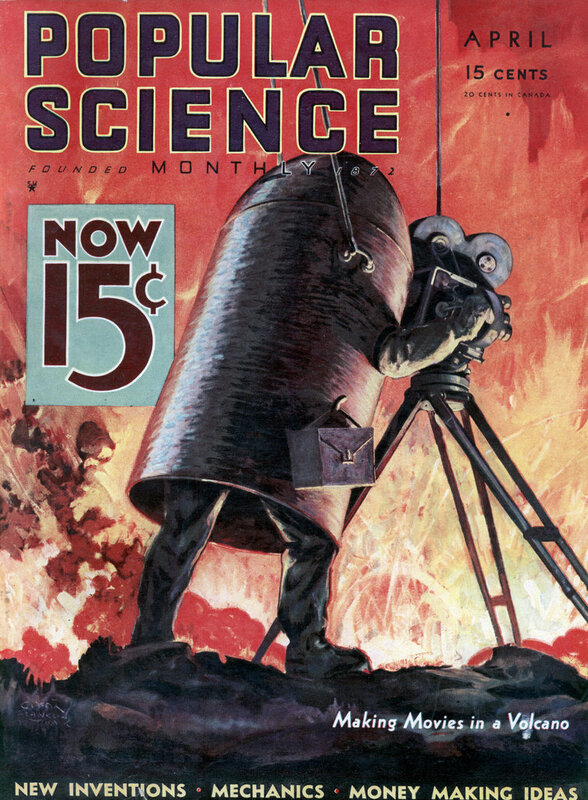 Readers of Popular Science Monthly already are familiar with the technique of animating mechanical animals for the movies. For such pictures only one-sixteenth of a foot of film can be exposed on a given scene and never more than twenty feet may be completed during a working day. Many of the scenes, particularly that in which the ape fights a squadron of pursuit planes while straddling the tower of the Empire State Building, are made up of four distinct shots merged into a composite timed to a split second. The mechanic. !I monsters move with apparent ease, but each was created on skeletons of metal duplicating those to be seen in various museums. But the problem was only half solved with perfect animation. In order to reproduce the ape’s jaw movements, as the six men hidden inside the massive head operated levers controlling the movements, it was necessary to expose- 238 frames, each measuring one-sixteenth of an inch. It would have been impossible a few years ago to film such a story. It might have been told in the form of drawings, yet the movies would not have touched the weird tale. But the technical growth of motion pictures is astounding. 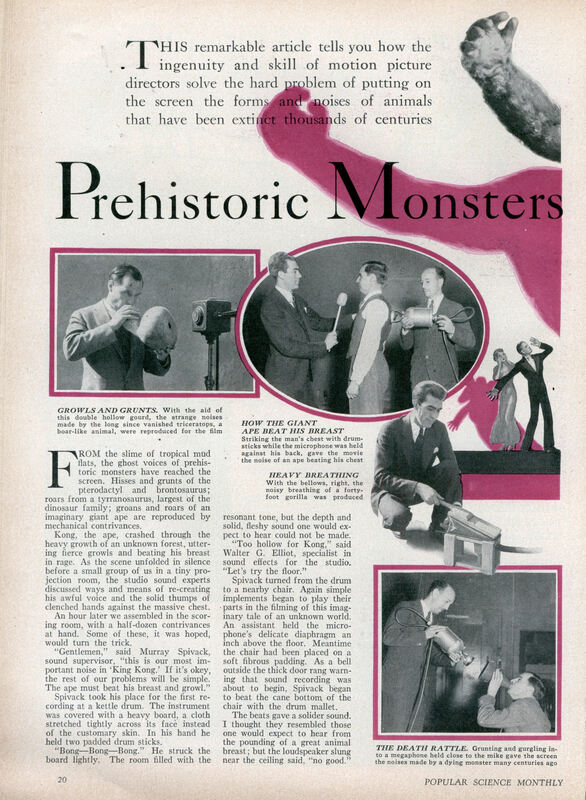 As the sound in King Kong demonstrates, the rapid development of electrical recording equipment during the last two years has made obsolete many devices previously used to manufacture synthetic noises for talking pictures. Fully three-fourths of these sound effects instruments have been discarded during the last year. SOME mechanically-produced noises sound more like the genuine sound than the original itself. One of these is wind. Another is thunder. Thunder is so expensive to record, so many takes being required at different times and locations to record one peal successfully, that most of the thunder you hear is synthetic. But the majority of animal sounds you hear are natural. Their recording is made possible through use of an immense electric ear, as large as a door, which picks up distant sounds and concentrates them at a small microphone placed in the center. This giant mike is able to hear hoof-beats before they become audible to the human ear, record them as their volume builds up and permit them to fade naturally into the distance as the horse canters by. Frequently natural noises are mixed, several sound tracks being run simultaneously in order to re-record them on a single track. With these, many tricks may be played, such as running one backward, another forward at an accelerated speed, or lowering the tone an octave. Some of the results would chill your backbone were you to hear them at night. AMAZING! AMAZING! AMAZING! that’s why I love this flog so much! history comes alive! and talks!